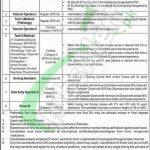 Get PAEC Jobs January 2019 Pakistan Atomic Energy Commission General Hospital Islamabad at this page of our site. A Public Sector Scientific and Technical Organization invites applications from Pakistani Nationals below 35 years of age for the following positions which are based at PAEC General Hospital Islamabad. Jobs in PAEC to apply are such as (Nurse, Telecom Operator-I, Technician-I (Medical) (Pathology), Telecom Operator-II, Technician-II (Medical), Nursing Assistant, Data Entry Operator-II, Driver). The appointment will be done on the regular / contract / contingent basis and duration of the contract is extendable on satisfactory performance of an individual and selected candidates may be posted/transferred anywhere in Pakistan and organization shall offer attractive pay scale and fringe benefits as prescribed by the organization from time to time. Candidates willing to apply for these positions are suggested to read the criteria mentioned in the following image posted below and according to the criteria candidates having a qualification from Intermediate / Matric / Nursing Diploma with relevant experience as per the demand of vacant positions. So, only eligible candidates meeting criteria should apply as per the following how to apply procedure given below. Applications along with attested copies of educational degrees /certificates/testimonials/ experience must reach the following address given below. Incomplete applications or that received after the due date will not be entertained. Name of the post applied for should be written clearly at the top right corner of the envelope. The last date for submission of application is January 22, 2019. Last Date to Apply: January 22, 2019. Address: PAEC General Hospital, H-11/4, Islamabad.